The graph represents a network of 230 Twitter users whose recent tweets contained “neo4j”. The network was obtained on Monday, 13 August 2012 at 21:53 UTC. There is an edge for each follows relationship. There is an edge for each “replies-to” relationship in a tweet. There is an edge for each “mentions” relationship in a tweet. There is a self-loop edge for each tweet that is not a “replies-to” or “mentions”. The tweets were made over the 8-day period from Monday, 06 August 2012 at 08:55 UTC to Monday, 13 August 2012 at 21:48 UTC. 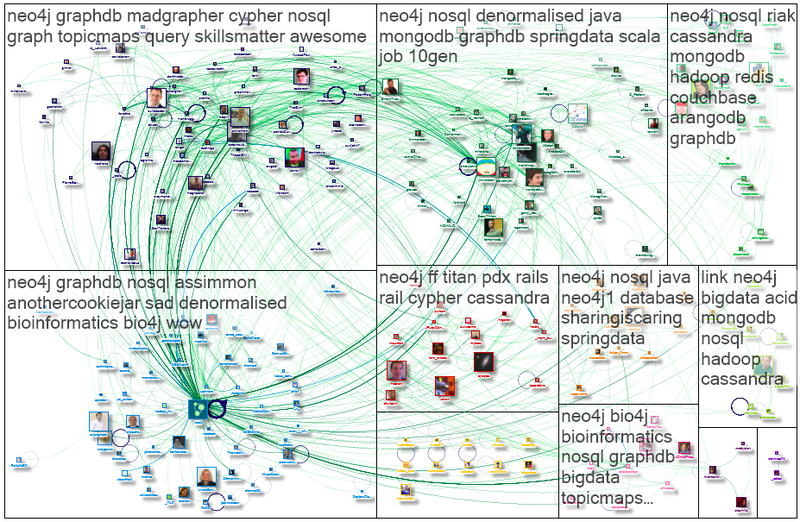 View on NodeXL.